A celebration of the food, flavors, and heritage of Eastern Europe—from the Black Sea to Baku, Kiev to Kazakhstan—Mamushka features over 100 recipes for fresh, delicious, and unexpected dishes from this dynamic yet underappreciated region. 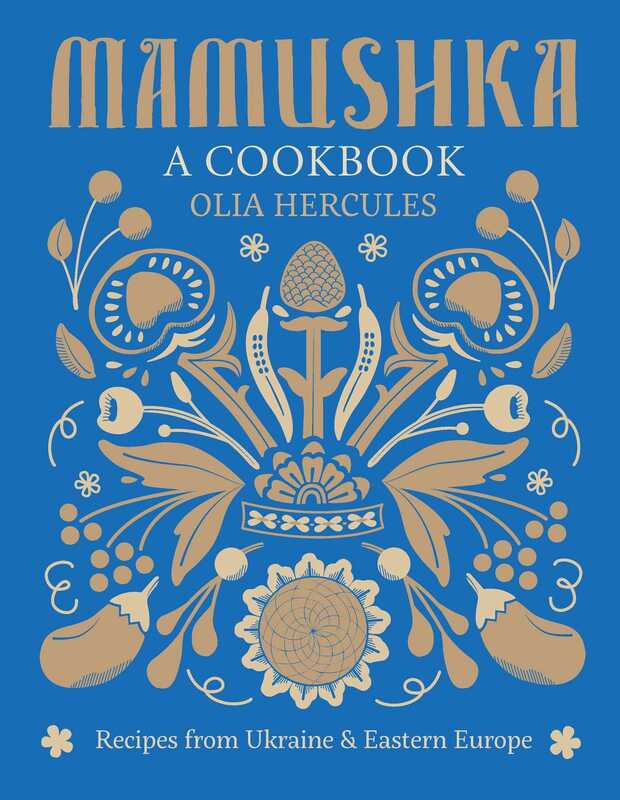 Olia Hercules was born in Ukraine and lived in Cyprus for several years before moving to London and becoming a chef. In this gorgeous and deeply personal cookbook, she shares her favorite recipes from her home country with engaging and loving stories about her culinary upbringing and family traditions. Featuring personality and panache, Mamushka showcases the cuisine from Ukraine and beyond, weaving together vibrant food with descriptive narratives and stunning lifestyle photography. From broths and soups to breads and pastries, vegetables and salads to meat and fish, dumplings and noodles to compotes and jams. You’ll also find some of Olia’s favorite dishes, like a Moldovan giant cheese twist and garlicky poussins, to sublime desserts such as apricot and sour cherry pie and a birthday sponge cake with ice cream, strawberries, and meringue. Including new flavor combinations, vibrant colors, seasonal ingredients and straightforward cooking techniques, Mamushka’s earthy dishes appeal to home chefs everywhere. Join Olia on this delicious and diverse culinary tour through Eastern Europe. 1 Spatchcock each poussin by cutting it along the backbone with a knife or scissors. Flatten them with the palm of your hand, then rub with the grated garlic and season generously all over with salt and the cayenne pepper. 2 Heat the butter and oil in a large, heavy-bottomed frying pan. Cook the poussins, cut side down, over medium heat for 3 minutes, then flip them over and cook them, skin side down, for 5 minutes. 3 Lower the heat and place a cartouche (a circle of baking parchment or wax paper) over the birds, followed by a smaller frying pan on top. Weight it all down with something heavy. 4 Cook for 20–25 minutes over the lowest possible heat. To test that the poussins are cooked, pull away at the legs – they should come away easily and the juices should run clear. 5 When the birds are done, lift them out and let rest on a chopping board for 5 minutes. Add the herbs to the buttery juices in the pan and cook for another minute or two. 6 Serve the poussins drizzled with the herby juices, or mop the juices up with some good bread, along with the Tkhemali. 1. Place the plums or greengages in a saucepan, add a splash of water, cover with a lid, and boil over medium-low heat until the fruits start to soften, about 10 minutes. 2. Mash them with a fork, then add the garlic, paprika, and treacle, and season with salt. 3. Cook with the lid off for another 10 minutes. 4. Add the dill and serve at room temperature with the Kurka tabaka (see above). You can keep the chutney for a few days in the refrigerator. If sealed in a sterilized jar, it will keep for ages.